Office buildings are glass and concrete edifices that support the actions of a company's most important asset — its people. Yet too many firms overlook the impact that physical facilities can have on business success. Many managers view offices as money-eaters that chew up budgets for leases and maintenance. Few see the workplace as a dynamic setting that can improve employee morale and spur greater output. Well-designed workplaces also help retain good workers who might seek jobs elsewhere. So says Ellen Keable, a principal in the advance planning group at Jacobs Engineering Group JEC, a global architectural and design firm with $8.5 billion in sales last year. "People talk a lot about the sustainability of the environment these days," said Keable, an environmental psychologist. "But you also have to think about sustaining your people." A recent online survey of 500 office workers in the U.S. backs this point. For 80% of those polled, their office conditions had a direct bearing on how they perceived their employers. Many griped about extreme temperatures and messy bathrooms. Almost 70% said that office conditions affected their productivity and motivation. One-third of those polled said they had left a past job due to building problems. The survey was done on behalf of Blumberg Capital Partners, a real estate investment firm. Other studies show that exposure to natural light, pleasant views, indoor plants, open spaces and less noise can all have strong effects on worker health and morale. That's because such factors are tied to worker stress, says Kent Spreckelmeyer,an architecture professor at the University of Kansas who's studied office settings since the 1970s. "Recent research indicates the many positive effects of a natural environment," he said. Capitalizing on the trend is The Sky Factory, a private Iowa-based company that makes simulated skylights called SkyCeilings. Their artificially illumined skylights mimic the full spectrum of natural light in enclosed spaces.High-resolution images create a convincing illusion of blue skies and white clouds overhead, even in a dark basement. 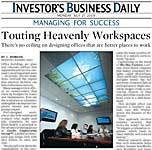 This skylight effect can improve a worker's outlook, says Bill Witherspoon, the founder of Sky Factory. "Our approach involves extreme accuracy that tricks the mind," he said. "It triggers a relaxation response, which leads to inner stability and reduced anxiety." Medical research shows that such relaxation helps reduce human heartbeats, slow breathing and lower metabolic rates, addsWitherspoon. "The result is a real behavioral change," he said.